Generally, one of the least surprising car designs has been, pretty consistently since 1963, the Porsche 911. It’s very much an evolutionary as opposed to a revolutionary design, but, somehow, it’s still exciting to see how it develops. And now we can see the 2020 version of the iconic shape, and it’s still very much a 911. But a very big 911. 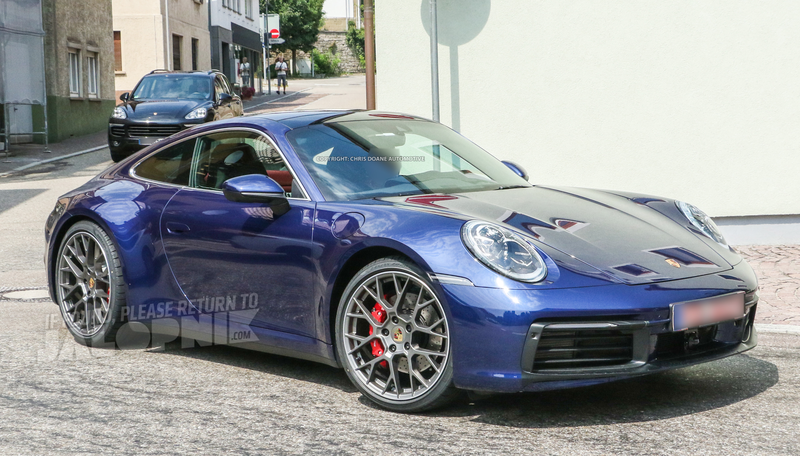 This newest 911, seen on some spy shots we paid for, looks like a 911 after a healthy diet of steroids in bowls of milk and a dedicated work-out program, with extra emphasis on rear-fender workout days. The car looks beefy. Also, Porsche, who do you think you’re kidding with the taped-over PORSCHE badge on the rear? What the hell else could this thing be? The new Chevy Cobalt? Come on. Also, why is just that rear side marker lamp taped over? Is Porsche about to blow our minds with some new side marker lamp innovation? Is Porsche angling for a Markie award? Also, it looks like Porsche is sticking with their vertical-slat air intake design, a recent design change after years of horizontal grille bars back there. I like the vertical slats; it reminds me of the ultimate Ur-Porsche, the Porsche 60K10. The forward-facing radar transceiver is quite visible in the lower grille area, though it looks like a plastic grille panel is missing. Will it be hidden, somehow? The new 911 is still very clearly a 911, but with some amplified proportions. I think it works, though, and it’s clear Porsche is taking no chances with the design. It’s a 911. It looks like something’s going on with the high-mount brake lamp, too. And what’s under that black trapezoid above the blur-tastic license plate? Also, the taillight appears to be full-width, but note the small black plastic block in the very middle; that’s likely to comply with Euro regs that specify two distinct rear light units. That may be deleted on U.S.-spec models. Holy hell, it looks like a 911!